It's probably not surprising that with no kids, I do not keep up on Parents magazine. 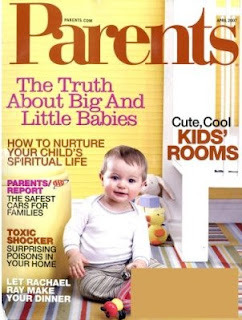 But, thanks to my cousin Jeny, I recently found out that Rachael Ray was featured in the April 2007 issue of Parents. In an article called Rachael Ray to the Rescue, Rachael helped a family with "three small children and no time to cook." They were in a rut and needed some advice on new recipes to make for their family. If you've ever checked out Cooking Rocks!, you'll know that Rachael Ray has a passion for coming up with kids recipes. She especially likes coming up with ways to trick kids into eating vegetables. The recipes featured in Parents fit both of these themes. Don't be turned off by the red hot peppers," Rachael told Helena and Joseph. "They add tons of flavor to this super-easy dish." For the kids, just pick out the peppers right before serving. Meatloaf Patties and Smashed Potatoes are a perfect recipe for a weekend dinner and the patties "cook in a quarter the time of traditional meatloaf." Rachael also recommends Pizza Burgers because they have a "familiar flavor, but it's more substantial" than just eating pizza. The last recipe was Crunchy Oven-Baked Chicken Toes, which I recently recommended to my boss when she had some kids over for dinner. They were a hit and healthier that what you'll find in the frozen foods aisle.